The Island: Castaway is rated 4.7 out of 5 by 48. Rated 5 out of 5 by happyhette from HappyFavorite This is my favorite game on Big Fish. It is like becoming part of a book. I wish that there were more games like this one. Rated 5 out of 5 by plat1098 from Don't Stop The Game Series Waiting literally years for the sequel (prequel?) to one of the most enjoyable games I can think of. Hits all the right notes: tasks are varied, multiple locations to venture to, you have many choices of which paths to take and what to do, the list goes on. I could use a timer but that's probably not feasible with the game's set-up. Great game--please bring out third installment for PC. Rated 5 out of 5 by Sarabe2 from Loved it! I wish they would make more games like this one! Rated 5 out of 5 by karema from excellent i throughly enjoyed this game and the sequel the island castaway2. i played them both in two days after getting the island for $2.99. turns out i had purchased island 2 in 2011 but never played it! the story is excellent, compelling and very well acted. the games flows one into the next, the story line carrying through. you control one main character and perform tasks as asked or needed. you hunt and fish and garden and gather to feed yourself. hunting and fishing require some practice but are really fun once you get it. there are chapters but not levels and its not timed. if your character runs out of energy or is attacked by a boar or spirits or snakes, he doesn't die, but looses some items and gets transported back to the village. you can buy and sell items to get whats needed to complete tasks or quests. everything is immediate, or if there is a wait time, its short and you can accomplish something else while waiting. i loved everything about this game. island 2 also said continued at the end, at a very critical point. i hope they meant it. i want to know what happens next. 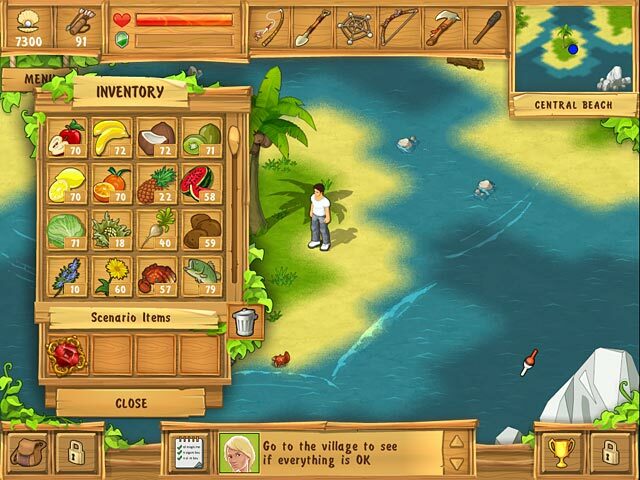 Rated 5 out of 5 by tehuti88 from The Island: Castaway I read a review critical of this game, that said gameplay basically consisted of "running around like a slave," gathering things on the orders of everyone else and cooking them meals. Is that basically what the gameplay is? Yes. It is. However, I found it oddly satisfying, and perhaps if you have hoarding tendencies like me, you will too. :# Plot: Your boat has run ashore on a mysterious island. You and your fellow passengers band together to set up camp and explore to see if you can find a way home. 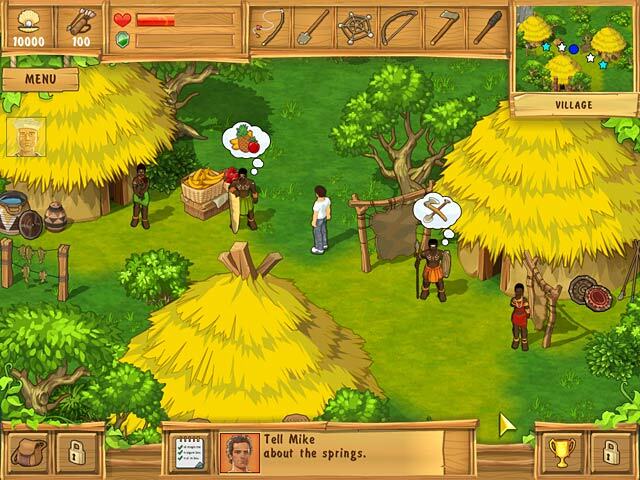 When you run afoul of the island's medicine man, you have to rely on your skills of hunting/gathering, preparing meals, and practicing diplomacy and trade with the natives in order to survive. Did I forget to mention the missing god statues you have to find, or the fact that it seems like there's a potential murderer in your midst...? Like I said...gameplay is about 90% running around collecting things and preparing meals at the behest of the other characters. Despite that, it's not boring at all. It's similar to a time-management or strategy game except there isn't any time management involved--you can take your sweet time following through on everybody's tasks #I'd find myself collecting pearls for trade, and catching lots of fish, and cooking lots of crabs, just for the fun of it#--and there isn't much strategy required either, since the island is terribly generous with its resources #food and supplies are lying around replenishing themselves literally everywhere you go#. There ARE some challenges, in that at times you have to find rarer items, you need to locate the missing god statues, and there are dangerous boars and snakes that can deplete your energy. But once you upgrade all your weapons and tools it's easy-peasy. #Make sure you upgrade everything you can as quickly as you can, especially your inventory bag and bow!# You do lose energy very quickly and very often doing all that running around, but like I said, there's food everywhere you look. Plus, once you learn recipes to prepare certain dishes, that replenishes your energy faster. I found the recipe aspect of the game kind of ludicrous and amusing #fellow castaway--"How about you prepare us some cocktails??" --me--"I'M TRYING TO GET US OFF THIS ISLAND, LADY! "#, but it adds some variety to things in that you need to gather certain items to prepare certain dishes. Once you meet the natives, you can trade with/sell to them. 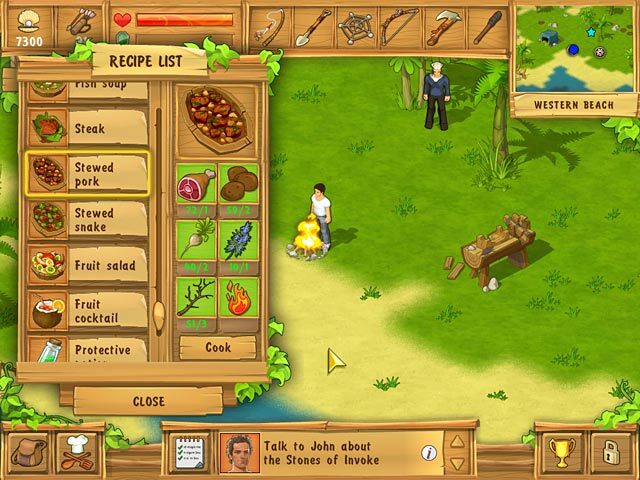 They also teach you various skills that make food and supply gathering even easier. A second review described this as a "pick-stuff-up game," which it is, and some more experienced players who are more into action and such might find it terribly repetitive, but it was just weirdly addictive to me and I was kind of sad to see it end. Every character has a unique personality, and there are all sorts of subtle conflicts going on; the plot got kind of confusing and hard to keep track of toward the end, but since you really don't have to figure much out--just pick stuff up and use it--that's not much of a problem. As long as you collect all the stuff you need--and make sure to keep your energy level up--you really can't lose. Even when you get poisoned by snakes or gored by boars you just pass out and wake up back in camp, perhaps with a few supplies missing. I got gold on every achievement, though I did have to spend quite a bit of spare time chopping trees and collecting pearls...and drinking cocktails. :# Animation is simple but crisp and colorful #it reminded me somewhat of the animation used in "World Of Zellians: Kingdom Builder"#. Voiceovers are kind of melodramatic but well done. There is mild adult language/violence and some very mild adult situations--nothing that requires a harsh warning #basically, one character hints that he'd like to go off to a cave to be alone with another, female, character, and then they get interrupted#, but if I noticed it, that means others might notice it too, just so you're aware. There's also occasional humor in the character interactions...I laughed aloud when the main character exclaimed to the American Indian character, "I feel like a Boy Scout!" and the Indian replied in deadpan, "No. You are a grown man...with a crab trap." *LOL* I seemed to play through the game rather fast, though I'm not sure if that's because it was short, or because I just got obsessed with collecting items! #I was so OVERprepared that by the time of the final challenges, when all the islanders requested certain items of me, I had to gather/prepare something for only one of them!# Also, although the main plot is resolved, the game ends on a cliffhanger...though there's a sequel, I don't think it directly picks up from the plot of this one, so I'm not sure what to make of that. :/ Oh well, I'll be checking it out anyway! So...are you ready to go and pick stuff up? :) I obtained my copy of "The Island: Castaway" as a direct download through an online retailer. The game folder takes up 506MB on my hard drive. I ran this game on Windows 7 with no problems. Rated 5 out of 5 by coha92 from EXCELLENT Game!!!! A game that doesn't want you to stop playing!!! I love it. 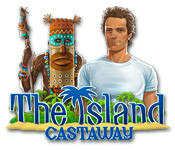 I also played The Island: Castaway 2 and both games are AMAZING!!! It suppose "to be continued" after the 2nd one but so far I haven't seen The Island: Castaway 3. Rated 5 out of 5 by CH1986 from Good Story! Overall a great game. Good for people that like the Sims, Animal Crossing, etc. Rated 5 out of 5 by nihalghfkhhhhh from the best game ever!! nothing to say about this game. this my favourite game. and the best game ever!! Rated 5 out of 5 by greymer from One of the most original titles on Big Fish It's not your usual HOG or "building" game. It's a fun, original, and absorbing adventure tale with gathering and crafting, exploration and discovery. Loads of characters and plot twists make this original title so much fun. I keep checking back hoping they will make a part 3!! An ocean liner was caught in a storm and wrecked in the ocean. Discover mysteries, save your friends, and get back home!